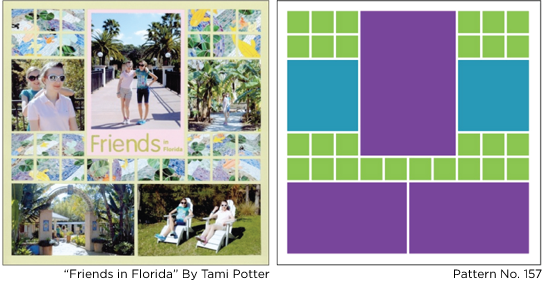 Mosaic Moments™ Pattern Gallery is a FREE resource to help you create fabulous scrapbook pages. 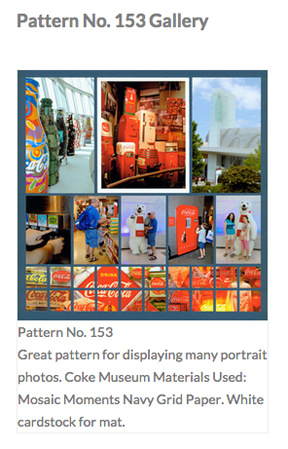 This article includes the information you’ll need to get the most out of the Pattern Gallery. Did you know that there are OVER 100 patterns on the gallery and even more being added each week! You could easily fill an album (or two) without using the same pattern twice. 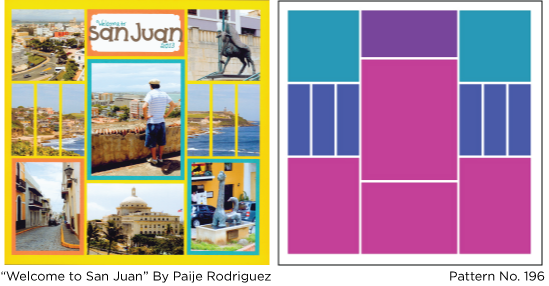 When you visit the gallery you will see many color filled images (like the pattern on the right). While you are in the gallery mouse over the patterns to see one or more page examples (such as the page shown next to the pattern). It can be overwhelming to look through so many patterns. 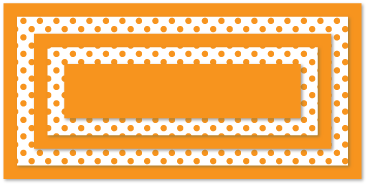 That’s why we offer filtering options – to help you find just the right patterns for your pages. 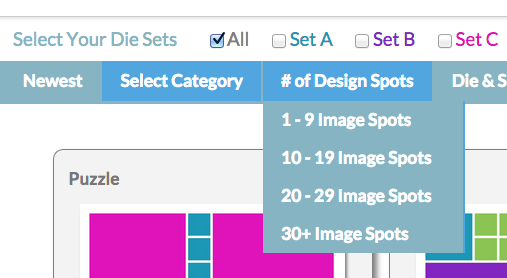 You will find that some die sets offer more pattern options than others, and some may have no pattern options if selected alone. The more die sets you choose, the more pattern options you will see. Each Die set has been assigned a color that represents the colors shown on the patterns. 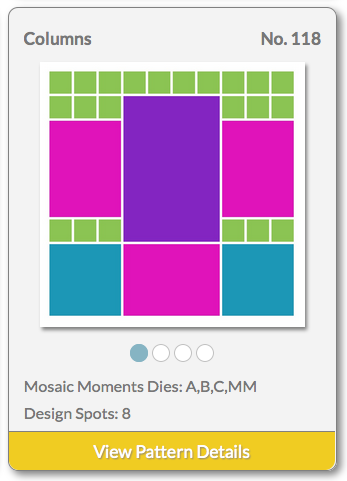 So if you select just set A, the gallery will be filled with the color teal that represents the A die. For example, below I checked Sets A, B, and MM die. As I click them the gallery automatically loads and show my options. Pattern 157 is one of them (shown on far left)! There are currently 8 different pattern categories to choose from. One of our favorites categories are the pinwheel patterns. Pinwheel patterns generally have a square center with rotating blocks all around it forming a pinwheel style design. This is pattern No. 197 – one of our more complex pinwheel designs, with lots of designs spots! 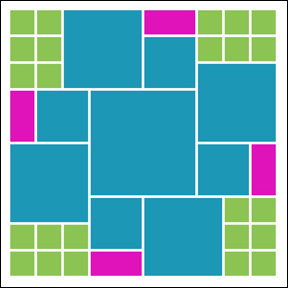 The patterns in the puzzle category do not fit with any other type. These layouts are generally scrambled, but that is what makes them fun to look at. This is pattern No. 179. Remember pattern No. 157 from earlier? It is a symmetrical pattern. 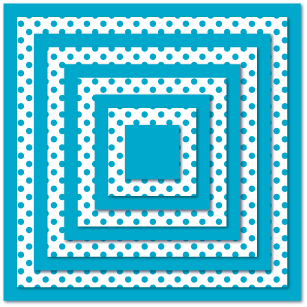 This means the spots are exactly the same on both sides of the vertical axis. 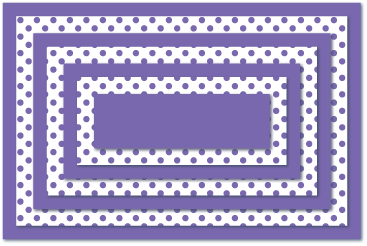 Symmetrical patterns are one of the most used. They are more formal, clean, and structured in design. 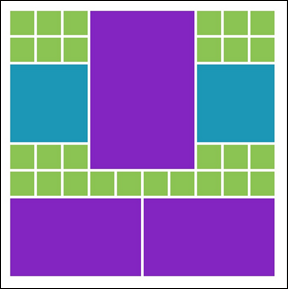 See examples of all Categories: Columns, Rows, Pinwheel, Puzzle, Mostly Squares, Mosaic Style, Symmetrical and Strips on the patterns gallery. You may have a certain amount of photographs and/or embellishments you would like to use. If this is the case you can search patterns by number of design spots (places you can fill with either photos, journaling, patterned paper, and/or embellishments). Mouse over “# of Design Spots” to view your choices. 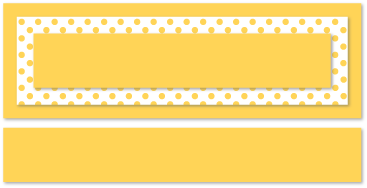 Here are a couple of examples from the other design spot categories. On the left is a sample from the 20-29 image spots and on the right is a sample from the 10-19 image spots category. TIP: Remember image spots can be for journaling, patterned paper, and/or embellishments, as well as for your photos. Choose a category that allows you to include it all! Now that you know how to navigate through the gallery, you’ll want more details! 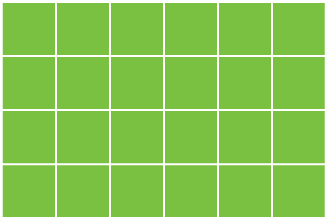 Example: What specific sizes are each design spot? Can I print this pattern? 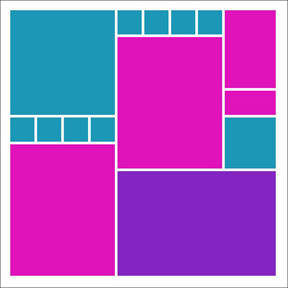 Which grid paper color was used to make the example page? The image above will show when you click on “View Pattern Details.” On the right you can see that each pattern gives the exact measurements you need and how many times you will use the dies (if applicable). There is also a “print this pattern” button. 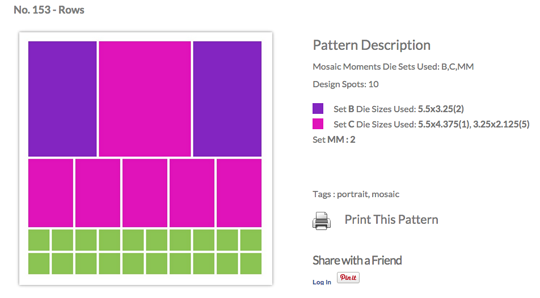 You can print patterns to have them right there with you while you work on your Mosaic Moments™ pages. Plus you can right notes if you need to. Don’t forget to tell your friends! From this page you can share on Facebook and Pinterest. 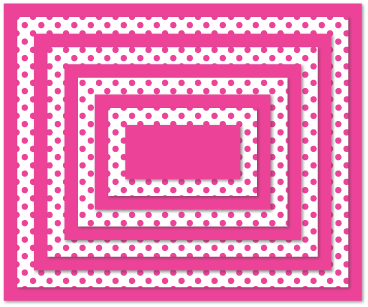 This is fabulous if want to introduce your friends to Mosaic Moments™ scrapbooking. When you scroll to the bottom of the page you will also get details about the page examples that are seen on the prior view with the pattern. The image description tells the materials used to create the page. 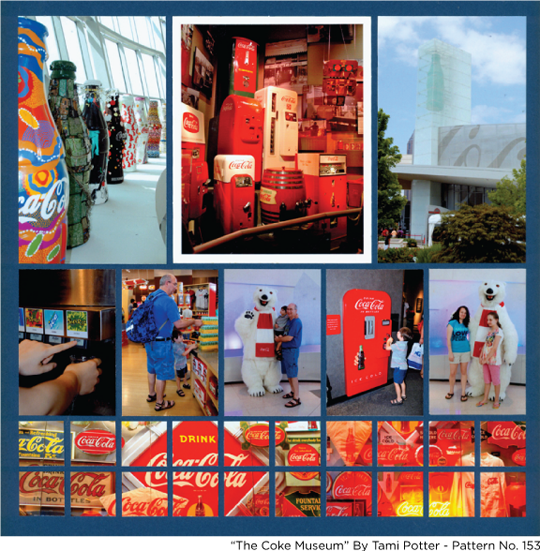 The gallery is a great because all the patterns are color coded to match the color on the die packaging. 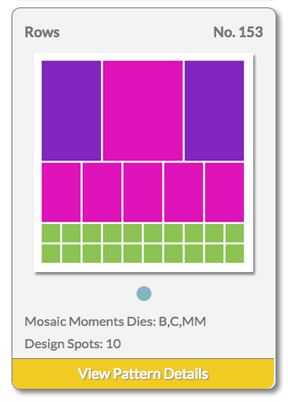 You will know, with just a glance, which die sets are needed to create each layout. You can find all of the dies at snapncrop.com. 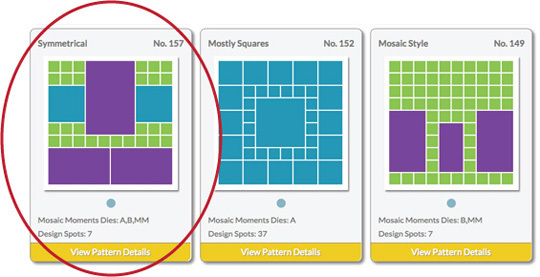 Check out our machine compatibility page on mosaicmoments.com to get shimming suggestions. We also have a couple of videos on our YouTube channel. See Candy’s instructions on using dies, and Tami Potter’s directions on using the 1 in. grid die.